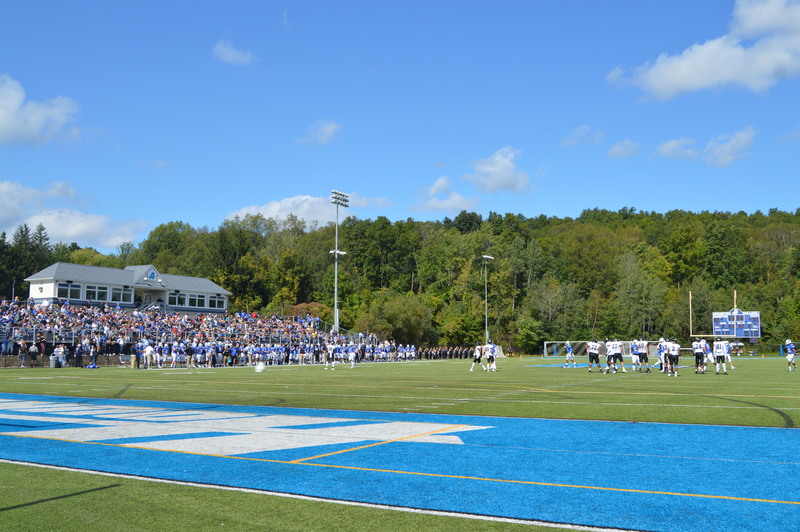 If you have not been keeping up with our Hound Nation, the football team had yet another landslide win on Saturday, September 29 against the AIC (American International College) Yellow Jackets. The huge win was a great kick off to Family Weekend, which leaving the friends and families that came out staring at a scoreboard that read: Assumption- 54 and Guests- 9. A score that left the Yellow Jackets with a very quiet ride back home to Springfield, Mass. The Hounds ended the first-half with the majority of their points on the board, an already victorious lead of 31-8. The offensive line was really doing great, with Doug Santos moving the Hounds down into the red-zone, allowing Cody Williams to rush the last six-yards to the end-zone and make the first touchdown of the game. Stephon Hill then forced an AIC fumble during their possession, allowing sophomore kicker Jacob Tondel to make a 34-yard field goal which pushed the Hounds’ lead to 10-0. In the second quarter, the Yellow Jackets then made a 32-yard field goal increasing the score to 10-3. However, Cody Williams was quick to come back with another two additional touchdowns. The first was a 19-yard touchdown made by Deonte Harris and the second was a 16-yard touchdown by Tighe Beck. The Yellow Jackets then scored their first and only touchdown of the game, which was soon to be followed by another touchdown made by Tighe Beck, leaving the score at 31-9 at the half. Then after such a strong first half, Assumption scored an additional 23 points in the final 30 minutes of the second half. The first two touchdowns of the second half were made by Beck and Harris respectively, increasing the lead to 45-9. Sophomore quarterback, Easton Turner, went in for Cody Williams, which then let Malcolm Major make a two-yard touchdown after Turner successfully made a whole 41-yard run. The game ended with Jared Vargus getting the final two points on the scoreboard with a play that was made possible by Seamus Wallace, where AIC fumbled in the end zone that allowed the Hounds to earn the safety. This game was a particularly successful one for senior quarterback Cody Williams, who raked in a total of six touchdowns over the course of the game. He was able to make 27 completed passes out of a total of 34, which led him towards his career-highs of throwing 360 yards and five touchdowns without any interceptions. 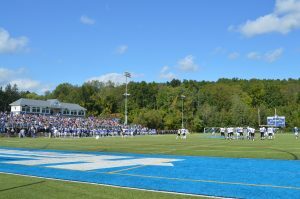 These numbers also made their way to the Assumption College Football Program record books, making his five passing touchdowns as the second highest total in any single-game and his notable 360 yards as the fifth. His remarkable performance and hard-work earned him the honor of receiving the NEFW (New England Football Writers) Association DII/DIII Gold Helmet Award, which was previously awarded to graduate student quarterback Marc Monks in both 2015 and 2017, and also Andrew Benson in 2016, who played as a former safety, but graduated with the Class of 2018. This made it the fourth year in a row that this award was given to an Assumption College student. Although the offense was really the talk of this game, the general collaborative win put the Hounds’ overall ranking at 4 total wins and 1 loss for the season so far and left the Yellow Jackets with their 0-4. Mallorie Rathbone, a senior, studies English Literature. She is a staff writer for Le Provocateur.